A moose on the run in Markham on Friday is believed to be resting after a day-long trip through residential areas and ravines ended with trackers losing sight of it. The last time officers with the Ministry of Natural Resources saw the animal, it was in the 16th Avenue and Kennedy Road area. 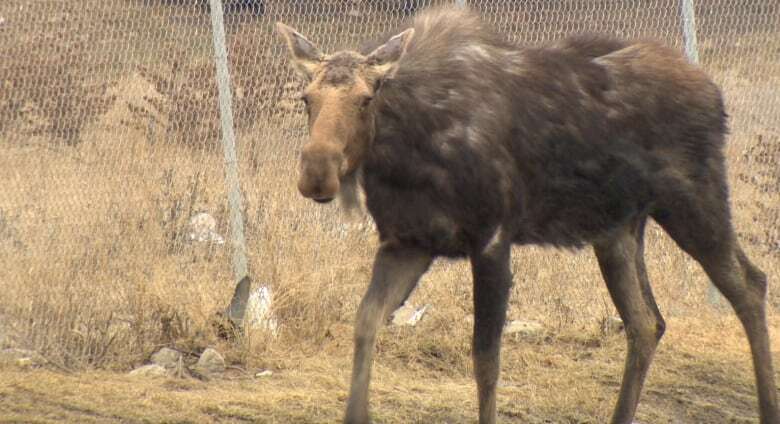 York Regional Police and the Ontario Ministry of Natural Resources had the moose in their sights for part of the day and had been planning to tranquilize it. Jolanta Kowalski, spokesperson for the ministry, had said the moose would ideally be sedated and relocated up north to central Ontario. But as darkness fell Friday evening, it escaped their sights. The animal was first seen around 7 a.m. south of the Buttonville Airport in the Highway 7 and Woodbine Avenue area. For much of the day, it weaved in and out of neighbourhoods, with some capturing videos of it on the run. At one point, the Ontario Provincial Police was involved in the search when the moose approached a provincial highway. But as the animal moved on, jurisdictional issues saw the service stop tracking the animal. Eric Cole, wildlife care manager at the Toronto Zoo, told CBC News the moose was a long way from home and may have been driven away from its original territory by an older bull. It's mating season for moose, he explained, but added that was just a theory. Either way, he said, "You have to immobilize it. You're talking about an animal that's 1,400 lbs — it's sheer power and it's not used to human contact. You can't throw nets on it, so it needs to be tranquilized." Cole explained the moose would have travelled from quite a bit farther north, perhaps near Peterborough or even Algonquin Park. "It's very unusual for it to come this far south," he said. "He's come quite a bit out of his natural habitat." For some, the sight of the animal so far south in the city was a thrill. Scarborough resident Danielle Reesor made her way to Markham to do some moose-spotting when she heard one was on the loose. "It's not every day you see a moose in the city. It's a little farther south than Algonquin Park, where I have seen them. It's kind of exciting," said Reesor, describing herself as an avid photographer. But OPP Sgt. Kerry Schmidt said an animal of this size could "easily" collide with a vehicle and cause serious injuries or fatalities. "This is a serious issue. We certainly don't want the animal to get hurt. We don't want anyone in the public, any drivers, to get hurt," he said. "And we don't want to stress out the animal either. Let's just let him get back into his natural habitat." "If a moose runs across the road, it can very easily kill someone because it can go straight into their windshield if they hit them."